I still go back to NUS for lunch occasionally. I almost always go back to the Science canteen to eat the claypot omelette with rice. Not only do I like it, it is one of the rare omelette that I can eat because it has no prawns inside. Their chilli is very nice too. There are two flavours, one sweet and the other hot. Both are very good, but the sweet chilli with the omelette is perfect. Update: they only serve one kind of chilli since a year ago to save cost. I really miss the sweet chilli. Since last year, I've started to pack-away the lunch to office, especially if I'm the only one going. It can be difficult to find places to sit, especially during the peak period. My colleagues prefer to go to some other canteens, like Arts or BizAd, for the "atmosphere". I try to avoid the peak period, so I try to reach there before 11:15 am, earlier if possible. It's okay with me because my usual lunch time is 11 am! There is usually a queue of 7 to 8 people, but the wait is surprisingly short. When placing my orders, I must tell them it's take-away. 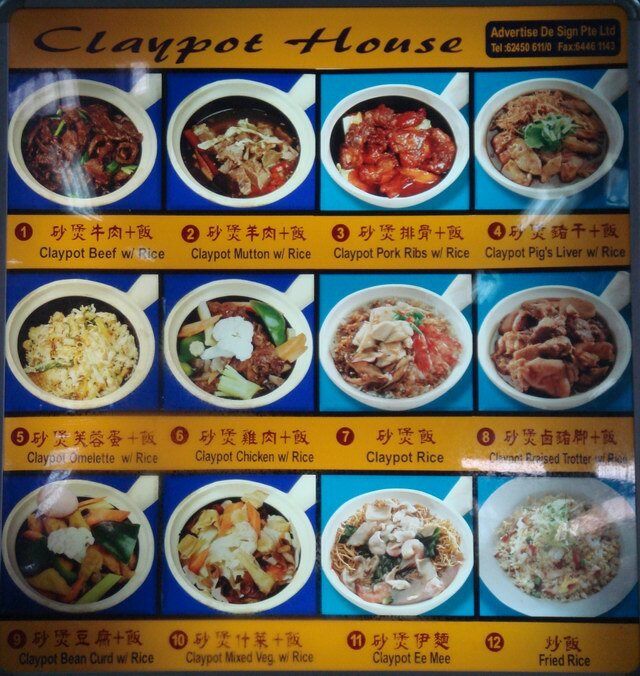 Apparently there is some difference for some claypot. I can usually make it back by 11:40 am. I like to go during the school holidays because there is no crowd and hence no queue! The start of a new school year is generally the most chaotic. Update: the prices were changed around March 2008.